02/01/2012- Lots of users were requesting SSH capabilities for Thecus NAS. One has been developed during the third-party module competition and even won the people's choice award! Thecus also has its own module, named HiSSH. It can be found in our download center for all V5 and 64 bits compatible NAS. Be sure to have an updated Firmware! But first, what's SSH? The principle is very simple: it allows the user to securely communicate between the computer and NAS using a rudimentary but powerful interface. Two things are needed: a SSH server (enabled by installed HiSSH) module and a SSH client. For Instance, PuTTY is very convenient and is one of the most widely used clients. With HiSSH, you are connected using a “root” account, also called administrator. Be careful, though! Root users have access and control to every file in the NAS. If any critical files are deleted, your NAS can crash and all your data might be lost! How to use HiSSH on a Thecus NAS? Install and start HiSSH module on your Thecus NAS. Either automatic or manual installation can be used. You are now connected to the NAS! 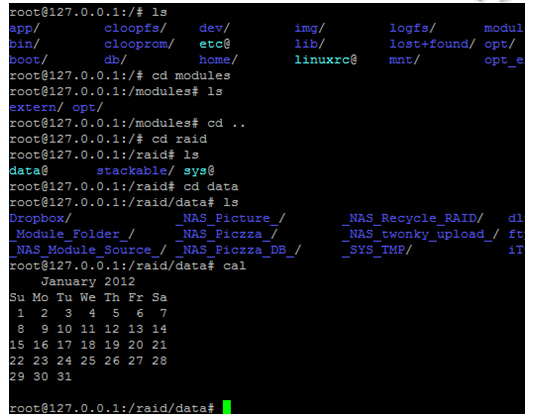 You can now use most of the known shell commands to browse in your NAS, stop a service, move folders, etc. Just keep in mind: safety first! Useful links for commands: http://ss64.com/bash/ Not all of them are working with HiSSH because the Thecus Firmware is made and optimized for Thecus NAS.